Kelly Namorato is the fourth- and fifth-grade ILC teacher at Phillip C. Showell Elementary. 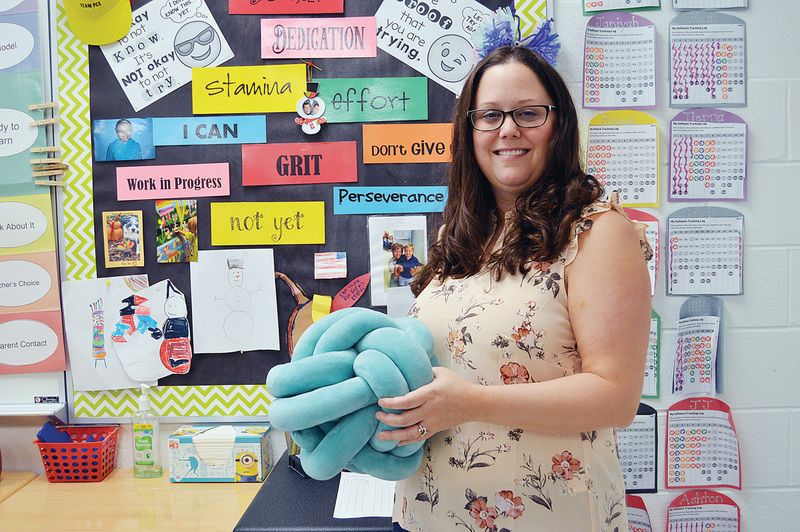 Showell’s Teacher of the Year for 2018, she starts each day with a morning meeting in which she passes around this giant ‘knot ball’ signifying that the holder can say whatever is on his or her mind. She uses a large, soft “knot ball” as a kind of “talking stick,” passing it between students who are sharing their thoughts on the day. As an Intensive Learning Center teacher at East Millsboro Elementary School, Namorato teaches children who “come to me identified as kids with a disability,” after being screened by such specialists as speech pathologists, school psychologists and special-educators. “I take the kids who are considered intense or complex — meaning that their needs aren’t necessarily addressed in the general-education classroom,” Namorato said. Once children are identified as qualifying for ILC instruction, “we take the information that they give us about strengths and weaknesses, and we develop an individualized education plan (IEP),” she said. An IEP is a detailed document that includes specific goals for each child; it’s a road map for teacher and student to travel together during the year. In Namorato’s case, she is the one who writes the IEPs for each of her students. “I’ve got to take care of some of the curriculum that IR gives me, but at the same time I have to address those IEP goals. It’s a balance,” she said. During the school day, Namorato is constantly thinking not only about how best to structure each day to meet each child’s needs but also to group them and their activities in the most logical, efficient way. “I have to take all the IEPs and kind of lump them together and say, ‘OK, this child needs this and this child needs this,’ and make logical groups not necessarily based on grade level but based on their academic needs,” she said. All of that has to be accomplished within the structure of the school day and within certain curriculum requirements. “I’m given a classroom schedule where I have to do so many minutes of English language arts, so many minutes of math, so many minutes of reading intervention, so many minutes of math intervention… I have to kind of find these groups or these pockets” of instruction time, she said. “It’s a lot,” she said of the daily requirements of her job. But it is that daily challenge that makes Namorato love her job. At the time, she had recently completed a reading specialist degree at Loyola University. “When I moved here, special-ed was kind of the next answer on top of that. How do I dive deep? What are those underlying things, those holes that are missing so that they’re not performing as well as they could?” Namorato said. Students learn how to communicate with others, develop empathy and support each other, she said. One boy, she said, “doesn’t verbally share a lot, but he will in morning meeting if you ask him about Legos,” she said, So, the other students will often ask him about his latest Lego creation. As the school year winds to a close, Namorato spends a lot of time making sure her fifth-graders are ready for the transition to middle school. “I always worry about sending them,” she said. Since she has had some of her students for three years, it’s hard to see them go. Namorato said continuity is also good for the students’ families, because there is a level of comfort there. Getting to know her students on a personal level is Namorato’s favorite part of her job. “I just feel like I know them. I can see things before they happen,” she said. She also sees herself as a “tough cookie” who pushes her students to meet goals and to strive for their best. “I’ll use the IEP to target need, but at the same time I want to keep them moving. I’m a very diligent person in that I want them to succeed as much as possible and I’m pushing them,” she said.